I wish I could say that I had been planning ORLT's 25th anniversary celebration for a long while, doing lots of deep thinking about the organization's journey and work. Founded to help the local greenway effort, ORLT has grown from an all-volunteer organization to five busy, full-time staff members. We’ve expanded our conservation reach from Athens outwards and have protected more than 32,000 acres in 32 counties. We don’t just protect land along the Oconee Rivers, either. Our conservation easements conserve many types of undeveloped land from forests to farms in watersheds across the state, including the Alcovy, Apalachee, Broad, Chattahoochee, Flint, Ocmulgee, and Ogeechee. I am lucky enough to visit almost every single property we work to conserve, and every time, even on the hottest, most humid day when I am not entirely thrilled to be out tromping in the woods, I am reminded of the quiet beauty of the undisturbed beech forest, the busy life of the beaver swamp, the lift to the heart generated by an open meadow, and the amazing tenacity of the life that survives on bare granite. It is a privilege to walk these beautiful properties and to work with their conservation-minded landowners. Grammy Award-winning banjoist Alison Brown and her band returned to Athens on March 22 for the 2nd Oconee Belles concert. All $25,000 raised at the event directly funds ORLT's mission, thanks to underwriters, the Riverview Foundation. While the concert lasted only a few hours, the money raised supports land conservation year-round,” said Carla Francis, ORLT outreach and development coordinator, noting that the concert also serves as a celebration and gathering place for the region’s arts and environmental communities. 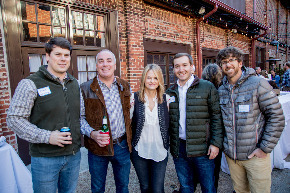 Just prior to the concert, hors d’oeuvres and cocktails were served in The Foundry’s courtyard, as a “thank you” to the event’s sponsors. Alison Brown made an appearance, where she greeted sponsors and took photos with many of the reception’s attendees. Jason Thrasher, artist and author of Athens Potluck, photographed the event. Local band Cicada Rhythm opened the concert, captivating the audience with homegrown talent, before the Alison Brown Quartet and guests took the stage. Brown is known for leading an ensemble that marries an array of roots-inﬂuenced music, including folk, jazz, Celtic and Latin, and is acclaimed as one of today’s finest progressive banjo players. Brown’s musical guests included newlywed duo Sierra Hull and Justin Moses and Grammy-nominated duo Rob Ickes and Trey Hensley. The land trust extends its heartfelt appreciation to concertgoers, sponsors, members, volunteers, and others who are working with ORLT to protect greenspace for people and wildlife. Stay tuned for information about the third annual concert, coming in Spring 2019. A special thank you: Riverview Foundation, UGA’s Music Business Program (MBUS), Hannah McIntosh (MBUS intern), Tommy Jordan, Troy Aubrey of Foundry Entertainment, Mrs. James Hall, and Stephen Humphreys of Athens Imports. Conservationists and landowners Russell Bennett and Carlton Walstad have established conservation easements preserving some important habitats for Georgia. A total of 1,200 acres is located in Houston County, near Perry, and includes both chalk woodlands and rare Blackland Prairie. Blackland Prairies, also known as Black Belt Prairies, are sometimes called “gumbo ﬂats,” due to the sticky consistency of the limestone-rich clay when it’s wet. The prairie hosts hundreds of native grasses and showy wildﬂower species. Created by a combination of seashells left behind when ancient seas ebbed and frequent fires, Blackland Prairies are found along a shoreline that once curved from middle Georgia through northern Alabama. Unfortunately, in many areas, these grasslands have been destroyed by agriculture and by efforts to suppress fires, which results in less fire-tolerant plants. According to Tom Patrick, a botanist with the Georgia Department of Natural Resources, Blackland Prairies are a globally rare habitat and are found in only a few locations in Georgia, including the Atlantic coastal plains and the red uplands of Houston County. Examples open to the public are found in the Ocmulgee and Oaky Woods Wildlife Management Areas (WMA), owned by the state near Kathleen, Georgia. The wildﬂowers typically peak in July. Patrick has identified several species of conservation concern on the property, including Southeastern Bold Goldenrod (Solidago rigida), which has previously only been found in northwest Georgia. Patrick also has found Boykin’s milkwort (Polygala boykinii), and Dakota vervain (Glandularia bipinnatifida) on the properties. 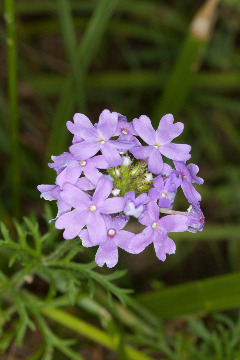 These plants, which are considered rare in Georgia, have been added to the Georgia Rare Natural Element database. The landowners are planning to continue prescribed fire as part of the future management of the prairies. While protecting Blackland Prairie is important, the “associated mesic chalk slope” forests and bottomlands found near these areas are also of “significant conservation concern,” according to Kristina Sorensen, a biologist who completed the documentation of the natural resources on the properties. In addition to the Blackland Prairie easements, Bennett and Walstad have also preserved 100 acres of greenspace that is contiguous to Hard Labor Creek State Park in Morgan County. 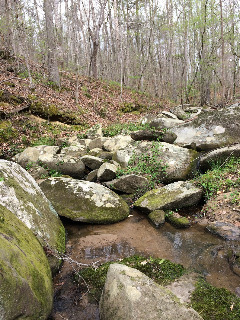 This property contains mesic and bottomland hardwood forests along Rocky Creek, which ﬂows into the park and adjoins another 900 acres that the landowners preserved in 2016. Photos by John Gwaltney. 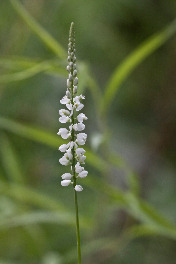 The purple flower is Dakota vervain (Glandularia bipinnatifida) and the white flower is Boykin's milkwort (Polygala boykinii). It's been a busy spring for ORLT and for birds alike. Whether or not a hike is specifically intended to be a bird walk or not, there's usually someone in the group who's keeping track of what's seen and heard. The beauty of hiking with nature enthusiasts is that it's impossible to part ways without having learned something new, whether it's the mnemonic of the scarlett tanager (pick-up truck! ), or the predatory nesting habits of brown-headed cowbirds (google it- you won't be disappointed). 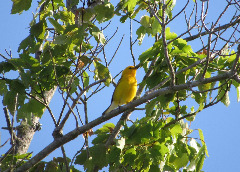 Anyhow, the point of this blog post is to share with you the bird species that were identified this spring on land protected by ORLT. Thanks to the birders who kept track! Whether you're counting birds, identifying trees, or simply enjoying the land, we hope to see you on an upcoming hike!